Star car at H&H's December Classic Auction at Pavilion Gardens, Buxton. was this a concours-winning 1953 Bentley ‘R’ Type Drophead Coupé sold for a staggering £123,600. 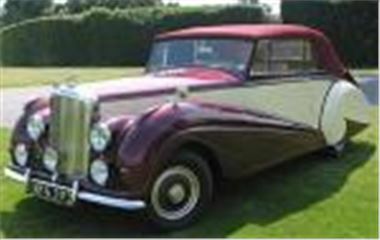 A Rolls Royce Silver Wraith Limousine of the same year was also keenly fought over and eventually made well over the estimate at £43,000. A 1966 MGB Roadster and 1971 Jaguar V12 E-Type Roadster also exceeded their estimates at £10,212 and £31,980. While an immaculately restored 1960 BSA Gold Star sold for £10,750. The results for the 600+ lots of automobilia were best yet achieved by H&H, and the automobilia sale total was £85,000. Highlights included a run of bound Motor Sport magazines being knocked down for £3,850, while a 1920s winged B bonnet mascot made over double its estimate at £687.50 – an amazing price. Among the many other treasures was a pencil sketch by none other than Ettore Bugatti. This also sold for well above its estimate at £396. Full automobilia, motor car and motorcycle results can be viewed at www.classic-auctions.com. The next H&H sale will be at the International Historic Motorsport Show, Stoneleigh Park, Warwickshire on February 26, 2005. Further information on for the sale can be found at www.classic-auctions.com or by calling +44 (0)1925 730630.